Dave King had one of the most remarkable careers in show business. Quite apart from his brief, but enviable, chart career with pop records, he was a successful comedian in both the UK and the USA, and subsequently a brilliant and much sought after serious actor. He first came to wide public attention shortly after completing his national service with the RAF, although he'd established himself as a young performer in the music halls even before being called up. He'd returned to the halls after he'd been demobbed, but a few brief TV appearances during 1955 turned into a BBC contract for his own series- a marriage that was to last until he was 'poached' by the 'upstarts' at ITV in 1958. His earliest comedy shows were quite groundbreaking at the time. He would banter with the BBC announcers and grew a particular rapport with the late Macdonald Hobley, who he called 'Hobbly'. This was quite unheard of at a time when BBC announcement staff were still attired in evening dress and bow ties. Not only was King an extraordinarily funny and innovative comedian, he could also sing- very well. 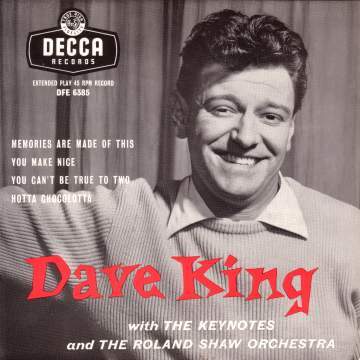 With a crooning style which borrowed much from the likes of Bing Crosby and Dean Martin, Dave King took the charts in his stride. Despite the fact that many of his songs were cover versions of numbers that competed with top singing stars, like Perry Como, they sold well. Although the wrong material was probably chosen for some releases, his first efforts had competent arrangements and production; King's popular exposure on TV was sufficient to guarantee their chart success. Despite Dave King's comparatively short spell at the top as a singer, he had two EP releases. The one shown on the right was the first released on that format- during 1956. It's a nice item to find because his earliest singles, which were arguably his best, are very hard to find on 45rpm. This EP contains four sides from his first four releases- including "Memoroes Are Made Of This" which first established him in a singing role. At the beginning of the 1960s, Dave King decided to try his luck on the other side of the Atlantic. He became one of the first British born comedians to be successful in the USA and soon had his own TV series there- apparently repeating the success he'd enjoyed in the UK during the 1950s. However, the initial rate of success faded somewhat and Dave King returned to England. He found things had changed and could not restore himself to the level of popularity he had enjoyed a few years earlier. After struggling in Variety for some time, he decided to make a dramatic career change and went into the world of drama. He subsequently became a very competent character actor and has returned to the small screen many times- though usually in the guise of a cockney gangster or something similar, rather than a cheeky comedian. Sadly, Dave King died on 15th April, 2002 following a short illness. DFE6514 1958 "Dave King No.2"